58472-BL is rated 3.8 out of 5 by 16. Rated 2 out of 5 by Carole from Mixed Review We just had entire shower redone. Loved our last Delta shower head but bought this one instead. After water is turned off, shower head seems to hold water that continuously drips even after shaking out the hand help device so the shower floor is always wet. Plumber has come out twice and has no idea how to stop this drip. 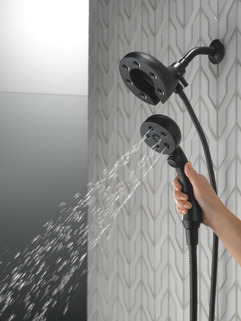 Rated 1 out of 5 by beachbum from Delta In2ition Shower Head The handheld portion of the shower head was too difficult to remove. Item was returned to Build.com without a problem. Rated 5 out of 5 by Ken from NY from Shower and handheld in one! We purchased this for our bathroom remodel because we wanted the flexibility of just a shower or pull down handheld. (Note: there is also a Brizo. Version if you want to go upscale.) Looking forward to using it! Rated 5 out of 5 by Alyse from Great finish Love this shower head/handheld combo. The long hose reaches the tub so I can use it when bathing my toddler. Has a great look to it too- the champagne bronze finish is so on trend! Rated 5 out of 5 by Shower lover from Great shower head! Great shower head! I love the features and the technology, great buy! Rated 3 out of 5 by Bill49 from It leaks We bought this at PDI and paid too much for it. It is better than the original Moen shower head that came with the new house, but after only limited use it is leaking around the housing of the large part of the head. It also doesn't. 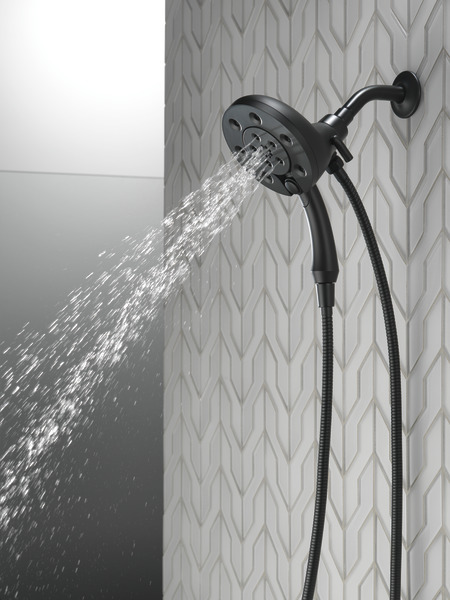 angle down enough and hits the wall of the shower stall. It should come with an arm that has a more acute angle. I would send a picture of the leak, but my phone would get wet doing it. 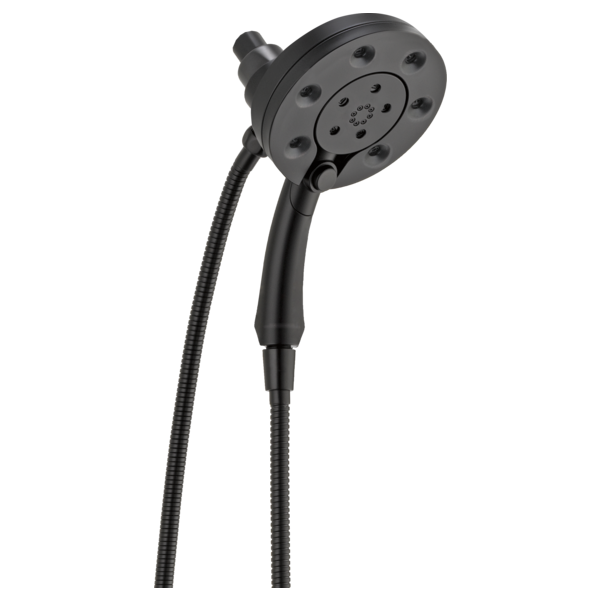 Rated 4 out of 5 by Liz from Feels like high pressure We are very happy with this shower head. I guess the H20kinetic technology really works, because it takes our limited GPM well-water pressure and really makes it feel strong. Nice looking in the matte black finish too. 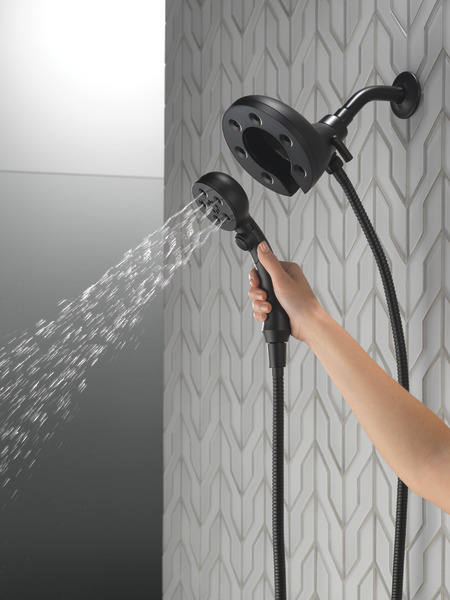 Rated 1 out of 5 by Birgit from Delta Two In One Shower Although the water pressure in my house is very good, I am not getting that with this shower head. I am getting fat droplets. I am short, and I cannot get the head to face more downward. This way the water showers all the way to the seat in the shower. I have tried every combination that is offered and none is to my satisfaction. Does the water shut of between settings or will there still be water coming out? also the stainless steel finish is it suppose to not show water spots is this a accurate feature of this finish? Can you get a 72&quot; or 80&quot; hose for the In2ition model 58472-SS or the chrome finish model? Is it possible to purchase a longer matching hose separately? Compare this 58472-SS with 58472, which part of it is stainless? Does this shower head come with the arm and flange? I am trying to make sure I order everything I need for my remodel, and the arm is pictured, but there are no comments about it. Thank you for your question. Delta Faucet model # 58472-SS does not include the shower arm or the shower flange. Is this shower head fully plated?